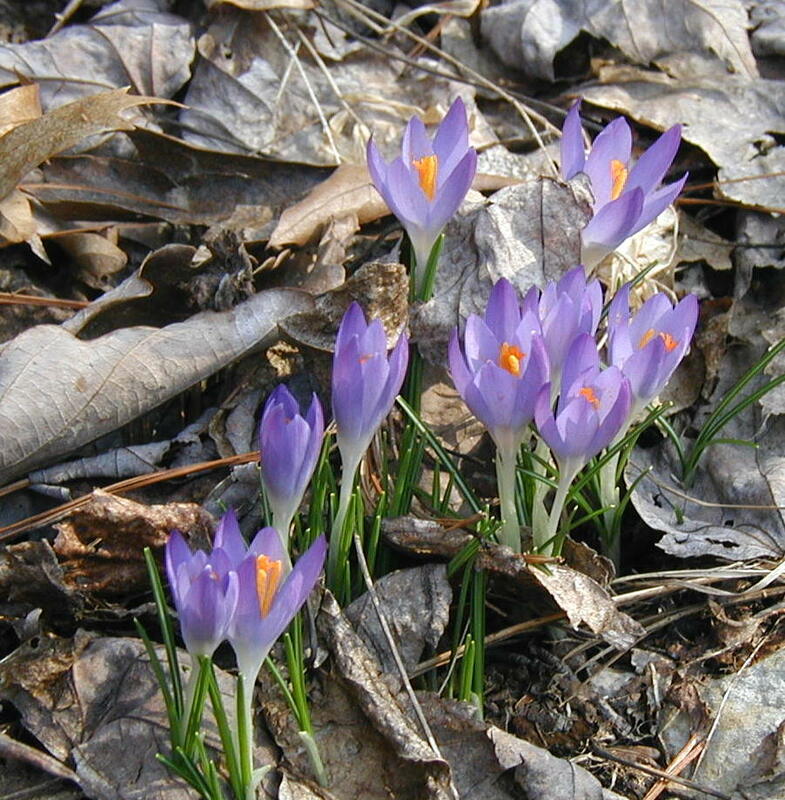 Bulbs and wildflowers are blooming now along with some early Spring flowering trees. Not many trees nor bulbs bloom in their entirely before April begins, but this is proving to be a different kind of year. Spring of 2012 is early and at times was way hot for March. Some plants seem to be mixed up regarding their blooming times. Some individuals have already bloomed and died back, while others of the same kind growing nearby are just now blooming or have yet to push out their flowers. Hepatica is a good example. Some hepatica plants that are already spent were blooming last year on 14 April, three weeks later than this year. 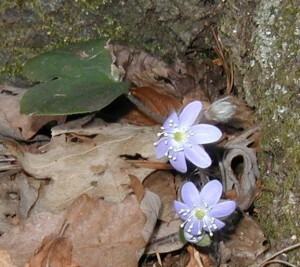 A few hepatica had both spent blossoms and flowers in bloom on 29 March 2012. Three hepatica plants past blooming. The flower stalks can be seen with their three maroon sepals. Photo taken 30 March 2012. Hepatica americana blooming with three flowers. Photo taken 30 March 2012. 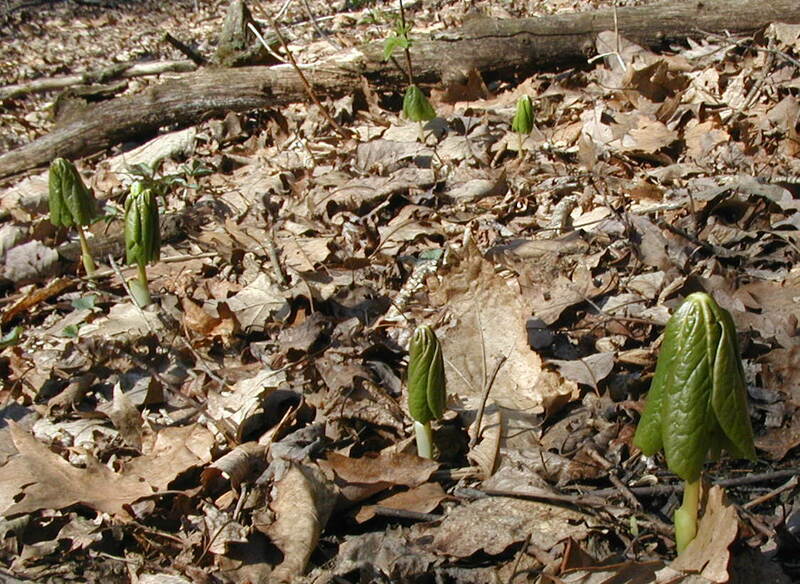 The end of March has to be the earliest I’ve seen Mayapples poking out of the ground. 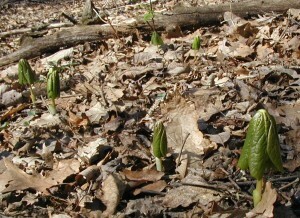 Mayapples poking out of the ground very early this year. 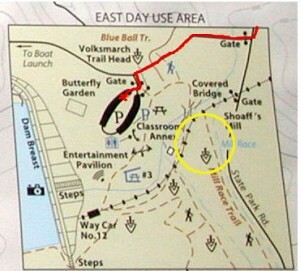 Photo taken 30 Mar 2012. 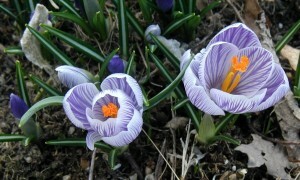 I’m curious to know with the extra warm weather and all, what early bloomers have surprised you this year? 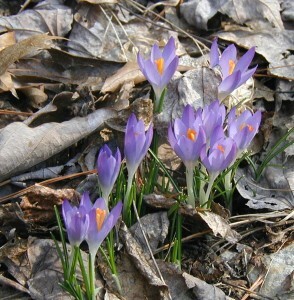 Tell us where you saw some early blooming! One of my favorite spring ephemeral flowers makes an appearance in woodlands of the Eastern United States during April. 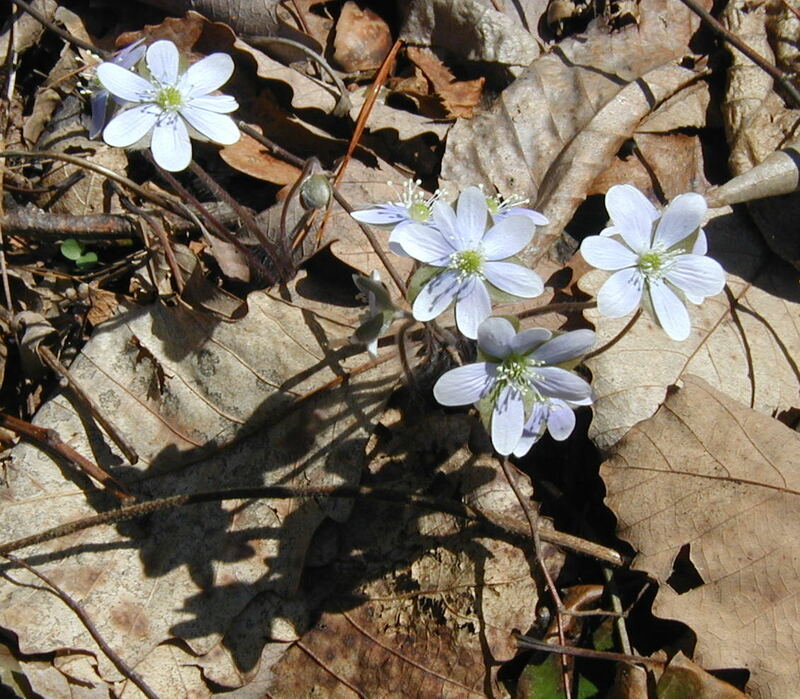 Hepatica americana, or just hepatica, is a perennial spring-flowering plant. Hepatica is a Spring Ephemeral because the plant grows, flowers and completes its life-cycle before the tree canopy is filled in with leaves. Once that happens the amount of sunlight reaching the forest floor is nil. Most plants won’t be able to receive enough sunlight in the woods, but the Spring Ephemerals start out early enough to prosper. White flowers of Hepatica americana open in the sunshine. 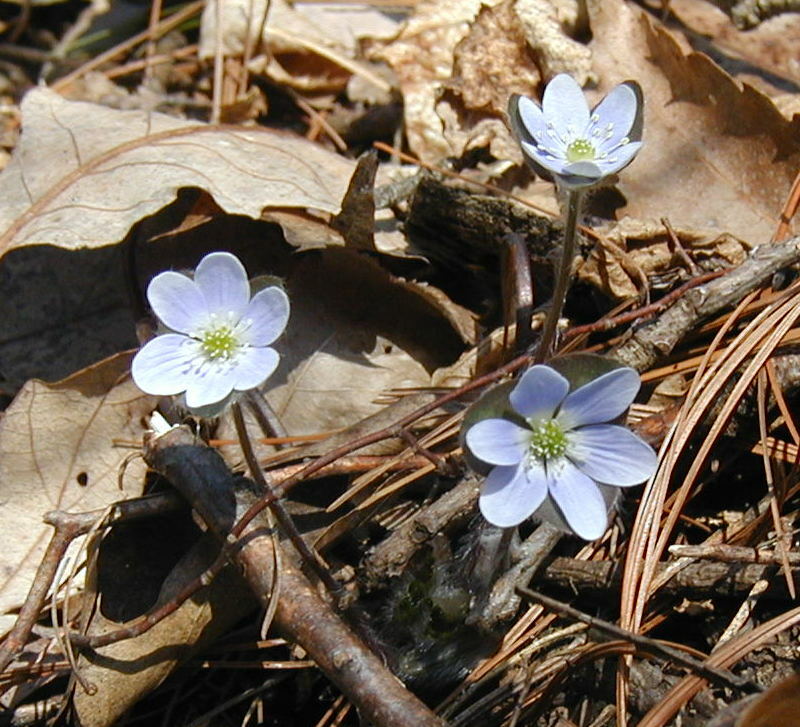 Hepatica is a delicate woodland flower with white, pink or lavender flowers that open in the sunshine. The purple to maroon flower stalks have long, soft hairs. Petals appear long with rounded tips. Stamens are cream-colored and of different lengths. 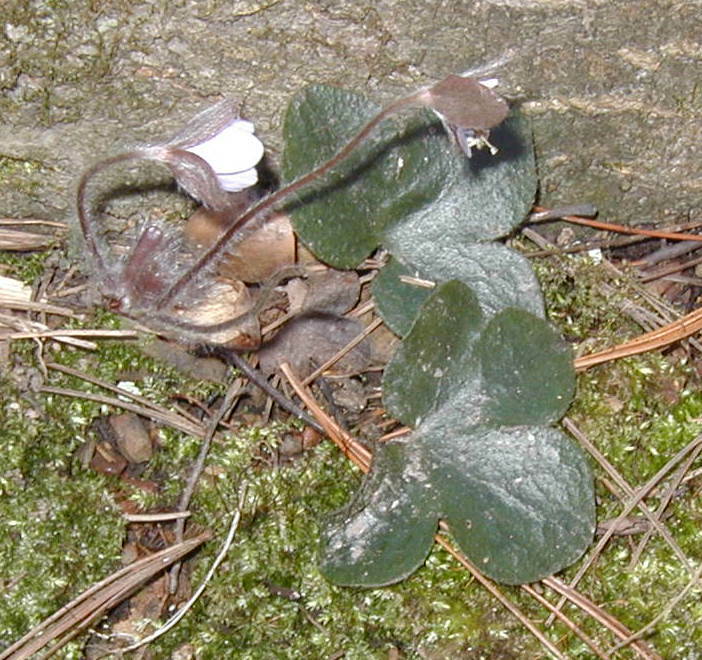 Hepatica leaves are larger than the flowers and usually have three rounded lobes, reminiscent of Mickey Mouse Ears. The leaves tend to lay flat on the ground, often hiding among the leaf litter. We all know a cardinal when we see one, so we can recognize the species and tell it apart from robins and redstarts. But can any of us profess to know individual birds? I would argue no – not without also observing behavioral differences or actions unique to the individual. Well, if we think about the same idea and apply it to plants, how can we tell individuals apart from one another? If planted or observed in prior years one has a pretty good chance of remembering where an individual plant put down their roots. However, without the common location from year to year I doubt many of us could recognize individual plants within a species. As behavior doesn’t really apply with plants we look for other characteristics that sets them apart from the rest. We say, “these are the early blooming variety of tulip” or “those hardy fruit trees are the ones resistant to such-and-such pox.” With wild plants I’m sure there are examples of sub-groups of species that appear differently or that have certain characteristics that set them apart from the average wild herb. Here, we have two examples of late-blooming spring ephemeral flowers. Little bloodroot blooming under older bloodroots. The little bloodroot in the image above was seen on 30 April 2010. Note the large leaves of bloodroot that overhang the little late bloomer. The seed pod of a prior blooming bloodroot can just be seen to the left of the large flower stalk on the right of the photograph. 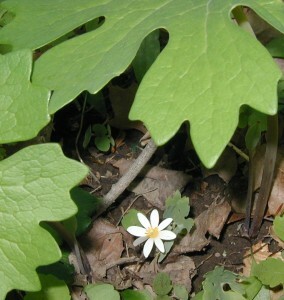 Bloodroot bloomed in South-Central Pennsylvania from 3 April to 18 April 2010, although only one tattered bloom was seen on the 18th. Once the ground gets warm enough to sprout the bloodroot plants, it’s like a mass blooming. The blooming may last for a week, but no longer than that except for singular plants here and there. The same is probably true for hepatica. 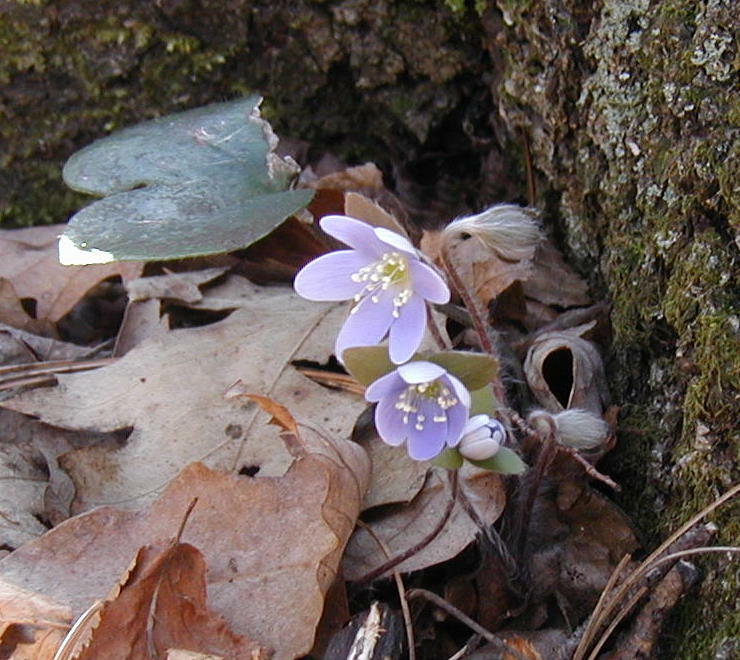 Late blooming hepatica with mottled leaves. 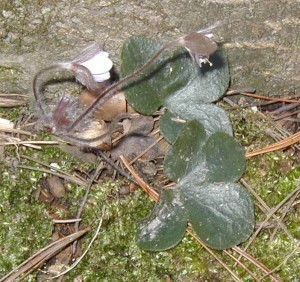 The hepatica blossom above is the latest one yet, spotted on 30 April 2010. 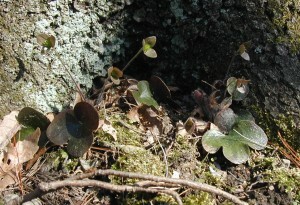 In the image above one hepatica plant has three light green leaves and a second plant, lower on the hill with the bloom, has mottled leaves. 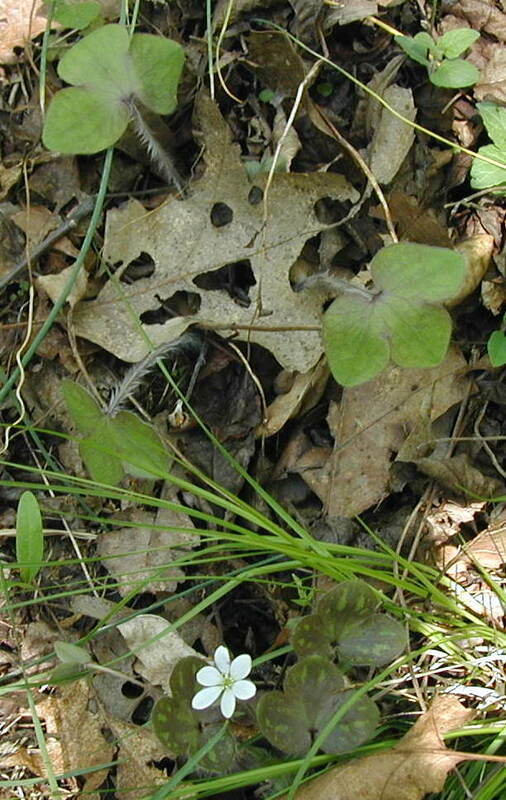 The mottled-leaf plant has one spent blossom visible on the left. Hepatica bloomed here a little earlier than bloodroot from 24 March to 3 April 2010. Individual variation is at play. Microhabitat variation wasn’t the cause of these late-blooming flowers as we saw others in same location that had already bloomed as witnessed by spent flowers and/or the presence of seed pods. The lesson here for all of us is that when we go out and observe nature or look for wild herbs, we need to remember that we’re there only for an instant in time. Many variables play on the growth, or lack thereof, of plants and animals. Timing can be everything. Next week or last week might have been the best time to find what you’re seeking, but that doesn’t mean a total loss. Like they taught us in school – Stop, Look and Listen! To that list I would add Smell! You never know what treasures lie ahead, so venture on! 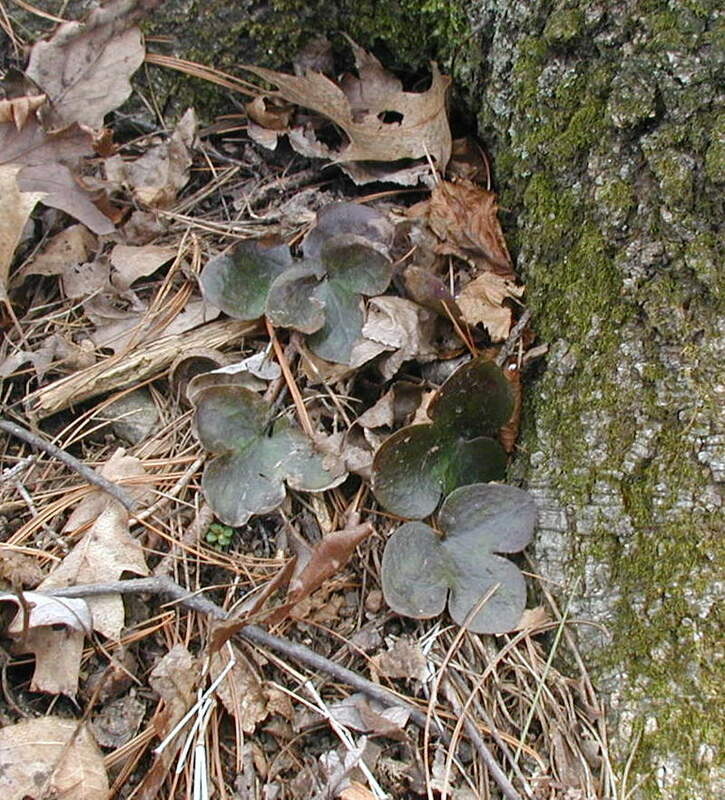 In reviewing the many pictures I’ve taken of hepatica in the woodlands I found a couple instances where the leaves were four-lobed instead of three-lobed. 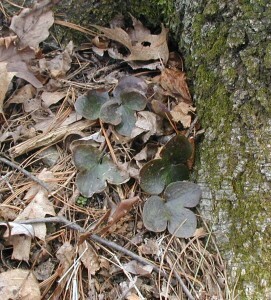 Lower leaf of this round-lobed hepatica is a four-lobed leaf. 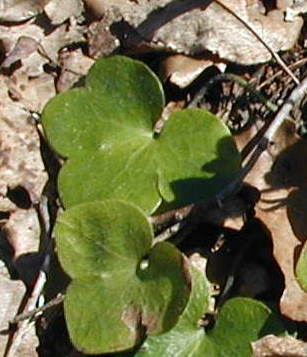 Upper leaf of this round-lobed hepatica is a four-lobed leaf. Some leaves will have four rounded lobes instead of the typical three rounded lobes, although the fourth lobe seems like an afterthought. Chalk it up to individual variation. If you sit long enough in a clover patch, you’re bound to find a four-leaf clover! 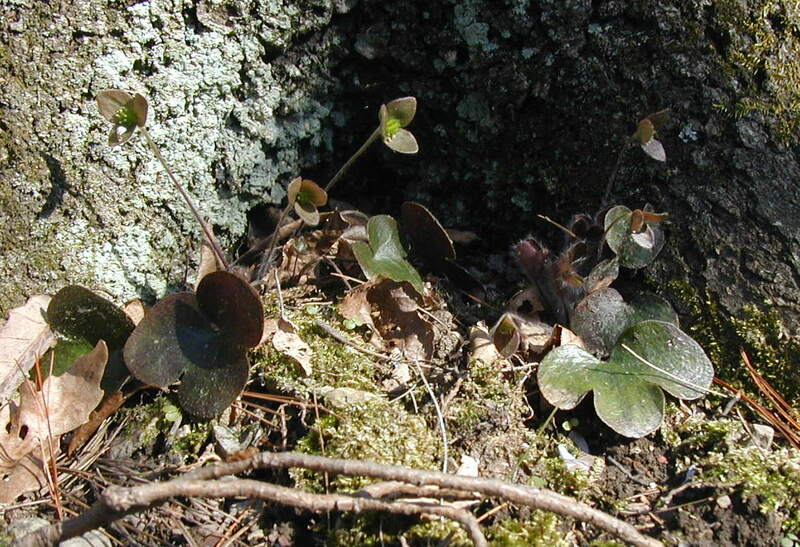 Round-lobed hepatica appears to bloom over a couple weeks time, with flowers coming and going according to the weather. Rainy, overcast and cooler weather hold back their blossoming. Like a lot of flowers hepatica blossoms close up at night, too. This daily opening and closing of blooms is probably related to changes in temperature. Springtime evenings are cool and even cold, so perhaps there is some advantage to the plant in keeping the reproductive parts warm by closing up their petals. 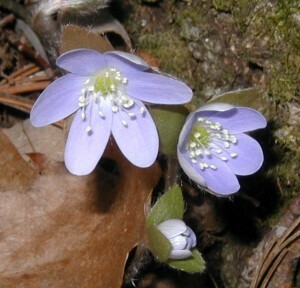 Round-lobed hepatica blooms open in the daylight. The colorful “petals” of hepatica close up around the stamens overnight. The photo above was taken at 11 am and shows the blossoms just opening up in the daylight. Note that the three rounded bracts are visible. Close-up of round-lobed hepatica flowers opening in the daytime. 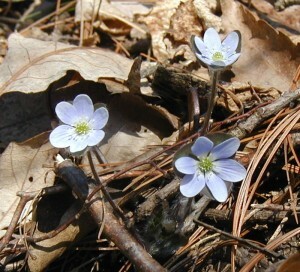 Close-up photo of morning hepatica blooms taken 1 April 2010. The same hepatica flowers at about 6 pm the previous day were fully open (photo below taken 31 March 2010). Round-lobed hepatica blooms fully open after a sunny day.